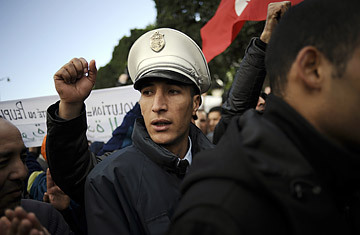 A policeman takes part in a demonstration on the streets of Tunis, on January 22, 2011. The pink piece of cardboard taped across Mohammad Inseebi's police vest spoke for him: "I am an honorable policeman and with the people's revolution," it said in Arabic handwriting. The mustachioed national guard officer struggled to hold back tears as he recounted his story to the crowd of men, women and children thronging the broad, tree-lined avenue in central Tunis named after the country's founding father, Habib Borguiba. "I want people to know the truth, because (ousted President Zine El Abidine) Ben Ali's regime wanted the people to hate us," the 20-year police veteran says. He explains the hardships he endured; the low pay, long hours, and constant badgering and interference from the first lady's family, the Trabelsis. "The regime replaced the rule of law with the rule of the Trabelsis," he says. "I thought you were my enemy but now I see that you are my brother," says Mahmoud, a middle-aged bystander who has been listening intently and pushes through the small crowd to heartily embrace the policeman. "I know that you were oppressed too." In the distance, further down the elegant avenue full of French-style cafes that spill out onto the sidewalk, the rumble of chanting protesters can be heard. A line of coiled razor-wire guarded by soldiers and policemen rings the nearby Interior Ministry. As I move with the crowd toward the noise, it becomes evident that the hundreds of demonstrators are all in uniform, police and national guard uniforms, with red armbands indicating their solidarity with the people. "Colleagues, you are victims, come and join us," they chant to the men in uniform on the other side of the razor wire. I enter the scrum and am immediately mobbed by policemen desperate to tell their stories. Some break down in tears as they speak. "Now I can talk, Ben Ali is gone, it's a new life," says Sami Nasser, 30. "We were pressured, we had orders to follow," screams another officer who says his name is Mohammad. "We didn't shoot the protesters, members of the Trabelsi gangs did," Said, a major in the national guard says. "Ben Ali is in Saudi Arabia and our wages are the same," the crowd chants. A tall, burly man in a helmet and navy blue uniform taps me on the shoulder. I have seen him before, several days earlier, at another demonstration also along this avenue. He was in full riot gear at the time, complete with baton and shield, and refused to answer my questions. "My heart was burning," he says, explaining how he felt that day. "I wanted to join the demonstrators, I felt with them, but I couldn't. Now, I feel free. " He is beaming from ear to ear. "We forgive you," Sayed Ramadan, a business owner tells the officer. "Sometimes I'd have to pay the police bribes, but it was a difficult time for everyone. I knew you had low wages." The police and national guardsmen are singing the national anthem. The crowds of citizens that have surrounded them heartily join in, clapping and applauding what just a few days ago seemed impossible. Since the president was ousted last week, the police have beat protesters with batons and fired teargas into crowds. The police and internal security forces were widely feared as the muscle behind the Ben Ali regime. But Saturday's protest marks a turning point. From the nearby Interior Ministry, a voice suddenly comes over the loudspeaker. It is the minister, Ahmed Friaa. At first the crowd strains to listen, but Friaa's voice is muffled and after a few seconds the crowd gives up and drowns him out with cries of "degage, degage" followed by "Where is Friaa, where is Friaa?" In a powerful act of defiance, somebody starts reciting Sura al-Fatiha, the first chapter of the Koran and a common prayer. The crowd of police and nearby civilians all join in, palms upturned to the heavens. "In the name of God, the infinitely compassionate and merciful," they begin. Daily prayers were forbidden in the workplace, several officers say, as part of Tunisia's bid to remain strictly secular. The prayer ends with deafening applause. "The fear is broken," an officer tells me. "We are with the people."